Is MLS Actually Doing Something Better Than European Soccer? Arsene Wenger thinks the Premier League offseason should be in the winter rather than the summer. Well, it'd do wonders for Blackpool's tourist-heavy attendance. The league currently plays July through May, a system that works fine when it's not snowing. 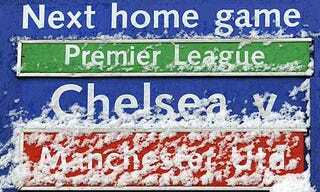 Last season, seven matches were postponed due to weather; already this year eight will have to be made up. Wenger wants to emulate MLS's spring-to-fall calendar, which with the Premier League's lengthy slate, would mean a February-to-November schedule. The obvious problem would be the summers' annual international competitions that Europeans possibly care more about than the domestic competitions, and which slide neatly into the current break. MLS's solution of just taking time off for the Confederations Cup and World Cup is inelegant, but let's be honest, not many MLS players go to the international tourneys anyway. All that being said, damning millions to a dreary English winter without even the balm of soccer is inhumane, and shouldn't be considered.